I recently completed an essay as part of a midterm assignment for my theory class about whether or not the five filters of Herman and Chomsky’s Propaganda Model apply to “journalist bloggers.” It’s an interesting question. 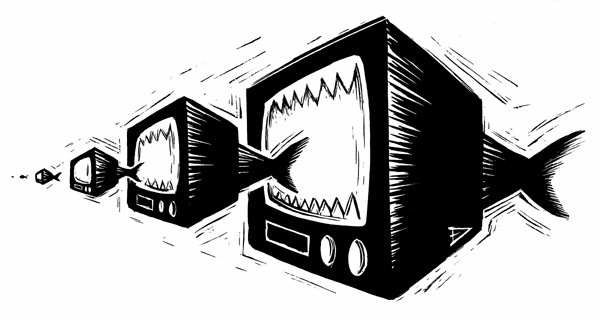 When Manufacturing Consent was published in 1988, media concentration was arguably an even larger issue than it is today. While ownership is more concentrated, there were fewer economically viable options for alternative news outlets to publish to a global audience. The internet, of course, makes it possible for a journalist to function more independently and not just as a freelancer working for some larger organization. But all news organizations have blog sections and most encourage journalists to run a blog of their own for easy additional content. It’s easy to see how these work in theory, but Herman and Chomsky took the trouble to actually detail the reality of it at the time they wrote the book. News outlets are for-profit ventures which owe a commitment to positive return for stockholders, gaining those revenues from advertisers who have a legitimate business interest in the content produced by the news org, content which must be sourced reliably from establishment (corporate and governmental) representatives who do not appreciate criticism, all of which runs the risk of generating flak to interfere with the professional relationships and reputation of the business (phew!). Then there is the pervasive ruling ideologies which seeks to frame threats to its stability as an out-group, some mysterious other which must be feared (whether they are communist “pinkos” or “islamist jihadists,” depending on what xenophobia is in style). While independent journalists deal with the fallout of the major media’s propaganda wars and all the influence generated by agenda setting between CNN/ABC/NBC/CBS/etc, they have a bit more freedom to do things outside the filters described above. I’ve been interning at Democracy Now! for the past two months, and heard a few stories from this perspective. During the press conference after the other American hikers were released from prison in Iran, it sounded like there was a pretty tense, adversarial attitudes towards the DN! crew and Amy Goodman, from where they could set up the camera to whether or not they would be able to interview Sarah Shourd (although they clearly were on the schedule). There was also the fact that when Ms. Goodman was arrested in 2008 at the RNC convention, a news producer asked her, “why wasn’t I arrested?” and she told him he had to get out there and not stay in the production room (IE, do your job). Unfortunately, access is often more important to reporters than principles. This entry was posted in Journalism, Theory. Bookmark the permalink.